I really enjoy collaborating with musicians to create instruments just for them. For my clients it's an opportunity to own a truly individual instrument, one designed and built to meet their specific, personal needs. It's always an exciting journey that leads to something new for both of us. We will work together from the very beginning of this process to insure that you are satisfied with the violin, viola, or cello that I'll be crafting for you. First we get to know each other. I always want to know if you've heard or played any of my instruments. We talk about sound, what it is you're missing now, and what it is you seek. We also talk about your other wishes. Perhaps there's an instrument you want copied â€“ just the simple dimensions or every last scratch? 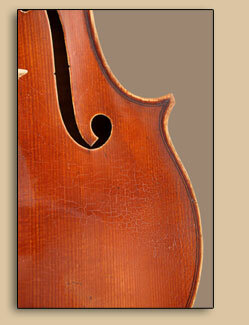 Maybe you would like gold and/or copper leaf lettering on the sides of your instrument? A special color for the varnish? Antiquing â€“ how much? Fancy pegs and tailpiece? There are lots of details to consider. Your personal wishes will directly influence our choice of wood and model. After we've established what you want, I figure out how much it will cost and give you a firm price for the instrument. To get on the waiting list and guarantee a price and delivery date, I require a $1,000 deposit, which will be deducted from the final cost of the delivered and accepted instrument. When I begin actual work on your instrument, you send me half of the outstanding balance. The remainder of the balance is due upon completion and delivery of your instrument. If, after a month, you are unsatisfied with the new instrument, and we both feel that a new effort will result in a better outcome, I will build you a second instrument as soon as possible. In the highly unlikely event that you are still unsatisfied when I complete this second instrument, I will endeavor to sell one of the two instruments crafted for you to a third party. Upon completion of that sale, I will refund all that you have paid me for the commission, less $250. Many customers request personalizing of their instruments. For all non-reversible personalizing such as gold/copper leaf lettering, actual copies of a specific instrument, uncommon string and/or stop lengths, etc., the return policy no longer applies. Additional charges will apply to all custom personalizing of instruments.